Yes, all these are caused by harmful bacteria! And in a bid to keep bacteria away and keep the rates of The Disease Which Shall Not Be Named low, many child care agencies are teaching our kids to wash their hands for at least 1 minute by singing the "Hand-washing Song". Video by the mum-in-law, who was trying to film my girl singing the "Hand-washing Song"
Unfortunately my girl wasn't being particularly cooperative and was only willing to wash her hands for at most 30 seconds, which is a common problem with most kids. Although children are washing their hands, they are not washing them with anti-bacterial soap or washing them long enough, perhaps because hand-washing is not a particularly fun thing to do. There is an alternative way that may just bring in the fun-factor! Lifebuoy has come up with a very ingenious way of getting your child's hands clean in a fun and cool way. 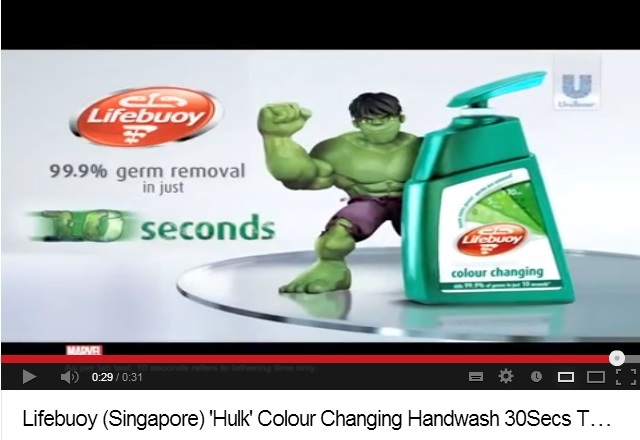 All your child needs to do is wash their hands with Lifebuoy's 'Hulk' Colour Changing Hand Wash until the liquid turns green, which signifies that the hands are clean enough to wash off! Teach germs a lesson, be one step ahead of infections with Lifebuoy! Disclosure: This is Part 5 of a series of sponsored stories on behalf of Lifebuoy Singapore. All opinions are my own.